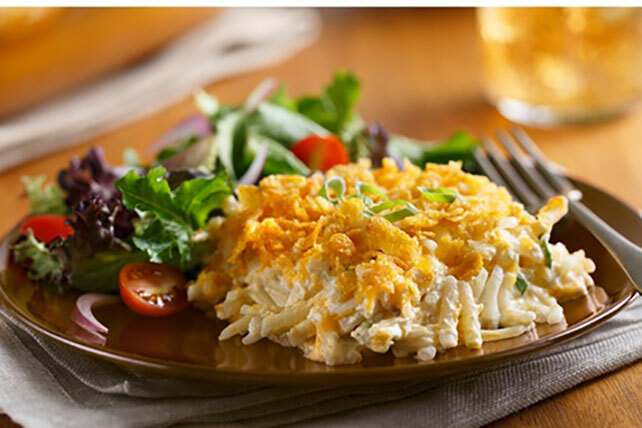 Try out a classic, easy Cheesy Potato Casserole recipe! This Cheesy Potato Casserole recipe is a perfect side for any meal. Serve with meat or veggies! Mix sour cream, soup and pepper in large bowl until blended. Add potatoes, cheese and onions; mix well. Spoon into 13x9-inch baking dish sprayed with cooking spray. Combine remaining ingredients; sprinkle over potato mixture. Bake 45 to 50 min. or until hot and bubbly. Garnish with additional sliced green onions before serving. Prepare using condensed cream of mushroom soup.